I decided to venture into Kohl’s to return the 4 items from my online purchase. You can see these items from this post. 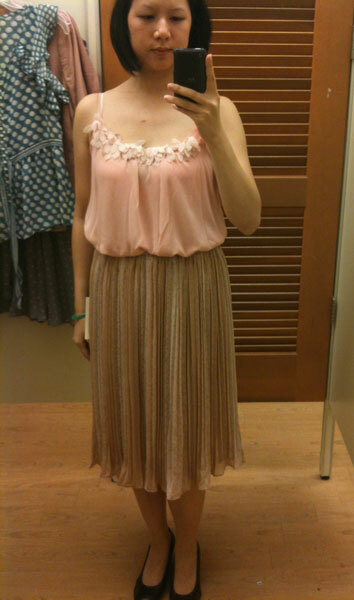 After almost 1 month, I hadn’t pulled out any of the items except the Cafe tint Pleated Skirt. I really liked the skirt but I felt it wasn’t me. 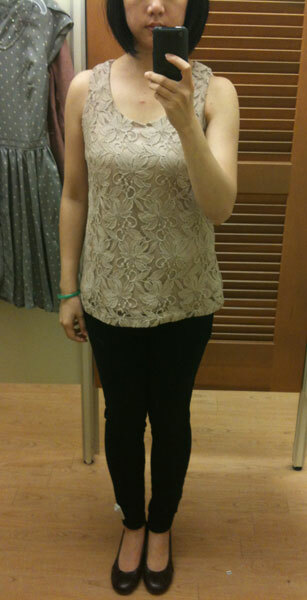 Well since I was at Kohl’s, I wanted to try on a few of Lc Lauren Conrad’s latest pieces. Lovely outfit. This is my favorite fitting. The look is flirt and romantic. Too bad it’s getting cold. I’m going to try pairing this outfit with a cape or tweed jacket. 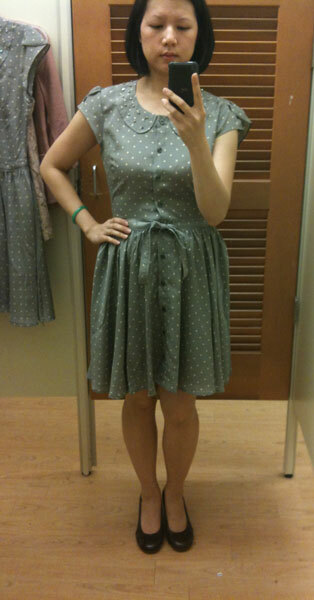 When I read reviews on this dress, many people said “Cute dress. Tacky Rhinestones.” Yes the rhinestones does diminish the appeal of the dress. It’s pretty cute in the picture though. My main problem was that single button underneath the tie at the waist. I was wearing a size 8 – very fitted but a bit too tight for me at the waist. Also with the size 8, the back was bunching, so I knew a size 10 would not work for my body. Such a shame. 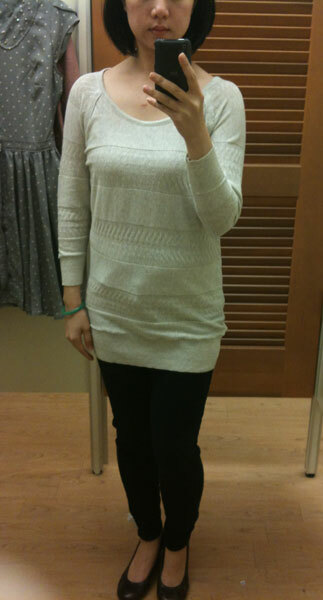 Cute and fitted sweater that I would really like to have purchased. The quality is a bit stiff to me, not as soft as I thought it would be. The bow on the backside gives a feminine, flirty appeal that is consistently shown through LC Lauren Conrad’s Collection. This is another top that has a tie back bow at the back by the neck. Very stretchy material that is flattering to many body types. I am wearing a size Small and the armholes are perfect and so is the length. I believe I can wear this with a blazer and pants, or even a skirt. I am wearing a size 6 in this blazer. LC Lauren Conrad’s sizing is pretty off throughout her collection. Some I wear XS, S, 6, 8, etc. With this blazer a 6 was pretty loose, but I couldn’t find a size 4 to try on. I do like the style. Many reviews online said the color is not a true pink as shown on kohls.com but more brown (a common problem this year even with different brands). I personally like a deeper pink color but the style of the blazer wasn’t really wowing me. 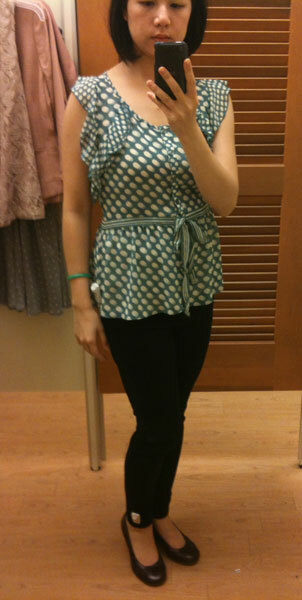 There was another blazer I tried on: LC Lauren Conrad Ruched Boyfriend Blazer, however I could only find a size 8. The size 8 was huge on me. The width of the arm holes were strangely wider than normal. It was a good idea to ruched the sleeves giving the blazer a more casual flair but it didn’t look right with the huge arm holes. I lvoe the color though. Did anyone pick anything up from LC Lauren Conrad?